The Mohawk territory of Akwesasne straddles the jurisdictions of Ontario, Quebec and New York State. As a result, Akwesasne is a major international border crossing between Canada and the United States. 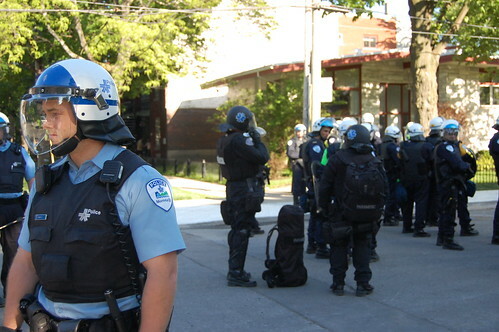 Canadian Borders Services Agency guards began arming in 2007, and there are currently more than 800 armed Canadian Borders Services Agency guards across Canada. 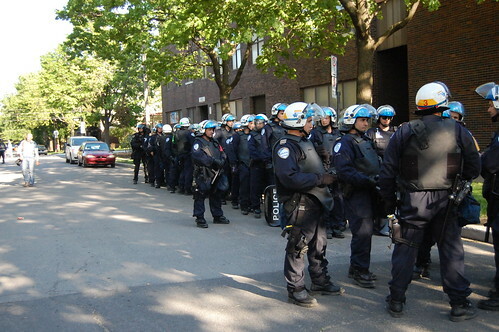 The entire Canadian Borders Services Agency is to be armed, in stages, by 2016. The Canadian Borders Services Agency announced that their agents at the Port of Cornwall would be armed by June 1 of this year. According to Mohawk Nation News, a Mohawk Band Council resolution forbids guns at the border. In the Mohawk territory of Akwesasne, local residents have protested for months against the arming of Canadian Borders Services Agency guards on their land. As of June 1st, the customs at the Canadian border’s port of entry has been abandoned. Earlier this week, Cornwall city cops and NYS police shut down the border. According to residents of Akwesasne, CBSA border agents abandoned their posts just before midnight, out of fear of reprisals from the community. To get some perspective on the issue, CKUT spoke with Sakoietah, member of the Warrior’s Society, Brendan White, Sandra Cuffe of the Dominion and 11-year-old Karoniate (Galunyadeh) during the week. This audio aired on the Friday, June 5th edition of CKUT. Thanks to Sandra Cuffe for photos. For more photos, click here. Check the Akwesasne Counterspin blog for updates. 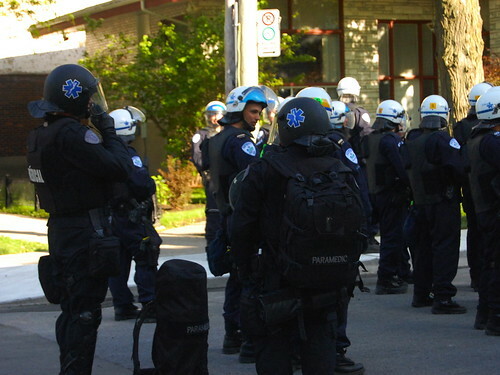 Last Saturday afternoon, riot police used clubs and pepper spray to evict squatters from two buildings in the Point Saint Charles neighbourhood. The first building was once home to a candle factory, but it is now abandoned and slated for demolition. Developers plan to build condominiums on the site, but activists have other ideas. The organizers of the Autonomous Social Centre (ASC) attempted to squat the building and establish it as community hub last week. Spokespeople for the ASC, who declared themselves anticapitalist and non-hierarchical in organization, said the social centre would include a housing project, an independent media centre, and a bike repair workshop, among other projects. Last Friday — just one day before police shut down the ASC — hundreds of people gathered in Point Saint Charles to march in support of the building’s occupation. “We have occupied this building because we lack adequate and accessible spaces and infrastructure and autonomous social projects…because PSC is on the front-lines of gentrification, because we have no other means to get what we need, what we want in this authoritarian society,” a spokesperson said, as squatters draped a banner reading “Liberated Space” on the former factory. The squatters have been building support in the neighbourhood over the past two years by organizing services including a communal bike network. But this didn’t prevent riot police from forcing the activists out of the building on the day of its official opening to the public. 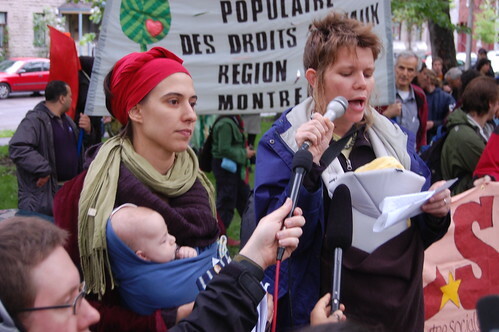 Immediately following the eviction, the squatters marched through the neighbourhood with demonstrators who had assembled for an emergency show of support. 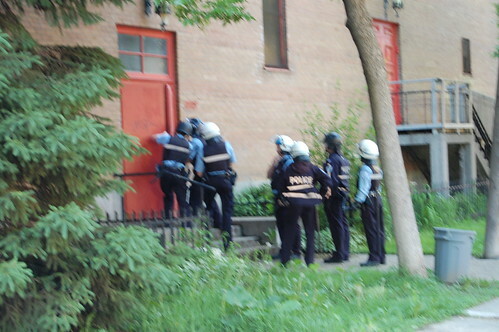 They attempted to occupy a second building — an abandoned church — before police, who were deployed throughout the neighbourhood, once again dispersed them with pepper spray and clubs. A long-time resident of Point Saint Charles who identified herself as Anik gave CKUT an eye-witness account of events that took place Saturday afternoon. A spokesperson for the ASC told CKUT on Saturday that organizers were disappointed by the immediate shut-down of the squat. She added that “the project is not dead,” but declined to offer details about the plans of ASC organizers.